Firstly a quick puppy update. Regular readers of this blog would remember that a couple of months ago, I relented to my family’s persistent lobbying and we bought a golden retriever puppy, named Dusty. Dusty is now 5 months old and she takes me for a walk on a daily basis. Golden retrievers are a beautiful breed of dog that were originally developed to assist duck hunters by swimming out into the swamps of Scotland to fetch poor ducks who had the misfortune of being shot. With such a background, our little Dusty is never happier on our walks than when she is carrying something in her mouth, and thankfully I don’t need to shoot it first. As we walk along she is constantly distracted by leaves blown by the wind, small sticks or pieces of paper. She picks them up and prances along with a skip in her step and her tail raised in joy. She is doing what she is meant to do and she loves it! Are you meant to sit in a cubicle day after day pushing paper around and responding to endless emails? Are you meant to sit on your backside all day at work and then all evening at home? Are you meant to commute for hours every week? Are you meant to work excessive hours just to pay off the interest on your credit card bill? 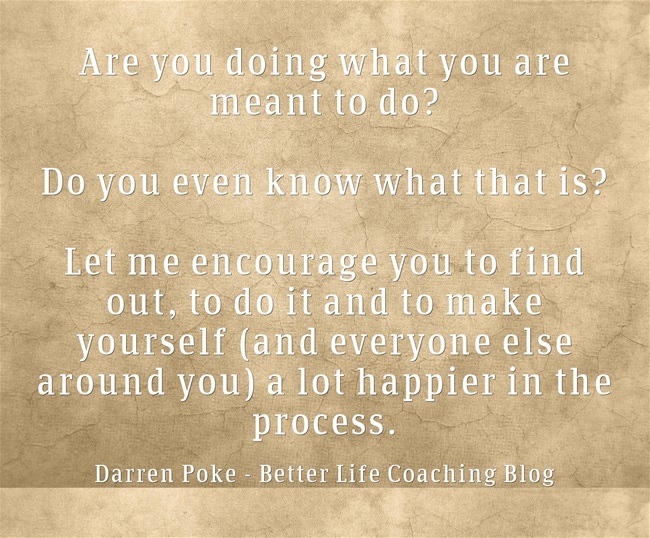 Are you doing what you are meant to do? Let me encourage you to find out, to do it and to make yourself (and everyone else around you) a lot happier in the process.